Most of the time, using a portrait orientation for document pages makes sense. Occasionally, such as when you have a large table that requires that extra bit of horizontal space, you might need to change to a landscape orientation instead. 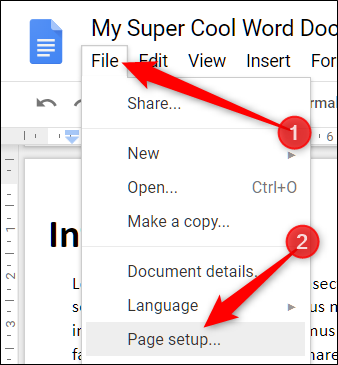 Here’s how to do that in Google Docs. 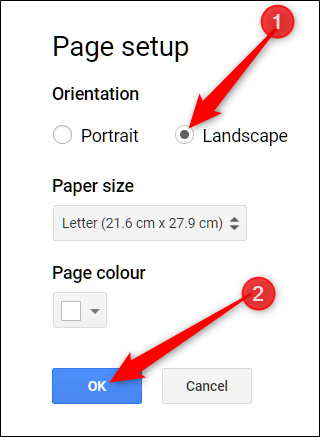 Unfortunately, Google Docs only lets you change the page orientation of an entire document, not just parts of it. If you’re coming from something like Word, which does let you orient different sections in different ways, you’ll have to get used to that limitation. So, you won’t be able to insert a single landscape page in an otherwise portrait-oriented document, something that would be very useful. Still, being able to change the orientation for your entire document can certainly be useful in some situations. Open the “File” menu and then click “Page Setup” to open the Page Setup window. At the top of this window, in the “Orientation” section, you can switch your document between portrait and landscape. Make your choice and then click “OK” to apply your selection. 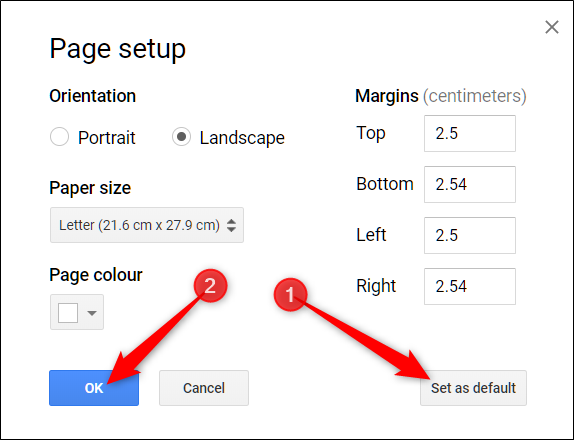 If you want to set landscape as the default page orientation whenever you open Google Docs, click the “Set As Default” button before clicking “OK.” The next time you open a new document, it’ll be in whatever default orientation you set. 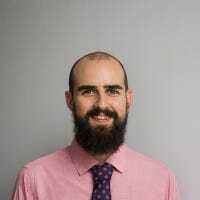 Note: While landscape mode may make most of your document look great, it has a quirky side effect of reordering and reformatting images and other media that may have looked great in portrait layout. Be sure everything is in order before sending it off to anyone for approval. That’s all there is to it. Once the window closes, your document is immediately turned on its side into landscape page layout, giving your tables, text, and images room to stretch out on the page.